Builds visual, motor, and critical thinking skills for reading, writing, and math! 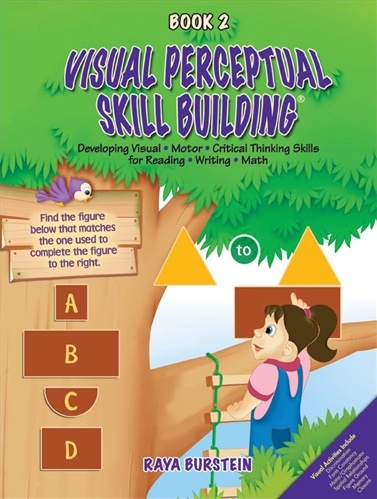 Visual Perceptual Skill Building® lays the groundwork for developing higher-level skills in reading, word recognition, prioritizing, and understanding spatial, linear, and sequential math. It also improves sequencing and visual memory skills. These quick, engaging activities are designed specifically for short attention spans. No reading is required. Directions may be read aloud as needed. Each book includes eight progressively challenging skill sections with pretests and post-tests to evaluate your child's beginning and ending skill levels. This book is intended for children in Gr 2-3 whose visual perceptual skills are developing normally. It is also very useful with children with learning disabilities and in the rehabilitation of children and adults after traumatic brain injury or stroke. 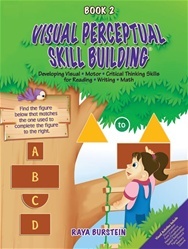 Many gifted early readers would benefit from working through the exercises in this series to ensure that they are developing the full range of visual perceptual skills. This title is also available as a book on cd. The cd contains black and white (as printed) and color versions of the book allowing teachers and therapists to print multiple pages or project data to a group. Visual Motor/Graphomotor Skills Each chapter includes pre and post tests.